Foxton had been impressed by the young Calcraft and got him a job flogging young offenders for ten shillings a week (roughly £43 today). One day, an emergency led to Calcraft being drafted in to assist Foxton with the double hanging of housebreaker Thomas Lister and highwayman George Wingfield at Lincoln Castle. Calcraft proved that he was more than capable of performing the unpleasant task and was chosen as Foxton's replacement on his death in 1829. His first job as London’s official executioner was the hanging of the murderess, Ester Hibner at Newgate on the 13th of April 1829. During his first year in the role Calcraft conducted no less than 31 executions and was mentored by the infamous hangman, Thomas “Old Tom” Cheshire. François Benjamin Courvoisier was a Swiss born valet, who was convicted of murdering of his employer ,Lord William Russelll. 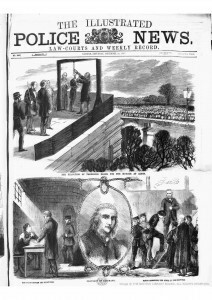 He was hanged by Calcraft outside Newgate Prison on 6 July 1840. A crowd of around 40,000 witnessed his death, including Charles Dickens and William Makepeace Thackeray. Courvoisier cut Lord Russell’s throat while he slept after being dismissed for theft. Calcraft’s services were in great demand throughout England although many began to view him as incompetent due to his controversial use of the short-drop hanging method; strangling the condemned to death rather than the traditional method of aiming to break the neck. This method resulted in a slow and painful death and Calcraft became well known for dramatically pulling on the legs of his victims or climbing on their shoulders in an effort hurry the process along. This method was found to be distasteful disliked by the officials and public alike, Calcraft received numerous death threats. Calcraft's botched execution of William Bousfield was a well-known example of his short-drop method. Calcraft fled the gallows after the trapdoor was released, leaving Bousfield dangling. Bousfield was still very much alive and managed to steady himself by resting his feet on the platform. Calcrafts’ assistant attempted to push his feet off as Calcraft hid from the mob of spectators in fear of his life. This carried on for a number of minutes until the overseeing Chaplin forced Calcraft to return and complete his duty. Calcraft began swinging from Bousfield's legs and the force of his weight killed him by strangulation. Frances Kidder was the last woman to be publicly hanged in Britain. 25 year-old Kidder was executed by Calcraft in front of Maidstone Gaol at 12 noon on 2 April 1868. It was alleged that she had drowned her 11-year-old stepdaughter in a ditch and the jury returned their verdict in only 12 minutes. Around 2,000 people, including Kidder's husband, were reported to have witnessed the execution. Calcraft is alleged to have found this particular execution particularly traumatic owing to Kidder’s youth, good looks as well the hysterical fear she displayed at the gallows. She was unable to stand and had to be held up by two wardens.